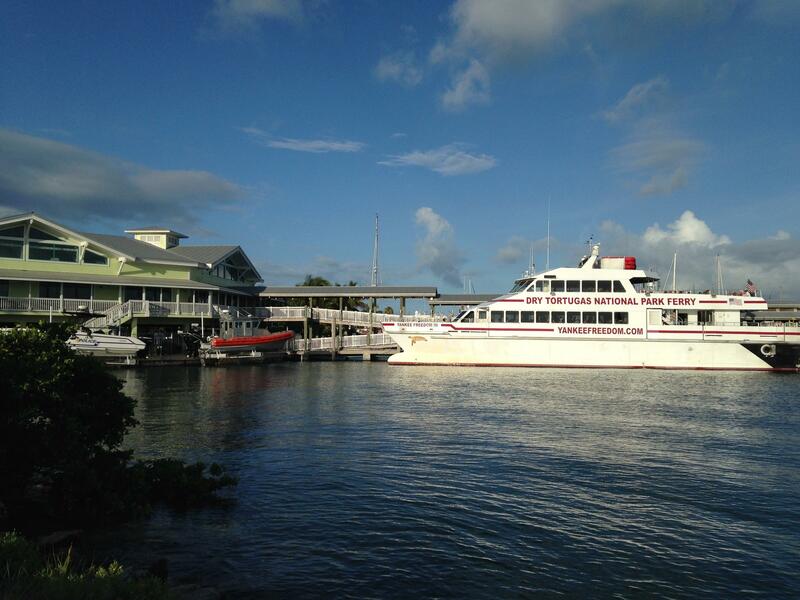 Every day, ferries come and go from the ferry terminal at Key West's historic seaport. For now, they're carrying passengers to Dry Tortugas National Park, 70 miles west, or from Fort Myers Beach and Marco Island on Florida's Gulf Coast. But many on the island hope the ferry traffic to Key West will soon regain one of its historic destinations: Havana. Earlier this month, the Obama administration took another big step toward normalizing relations with Cuba when it issued licenses to at least four companies to run ferries between the U.S. and Cuba. 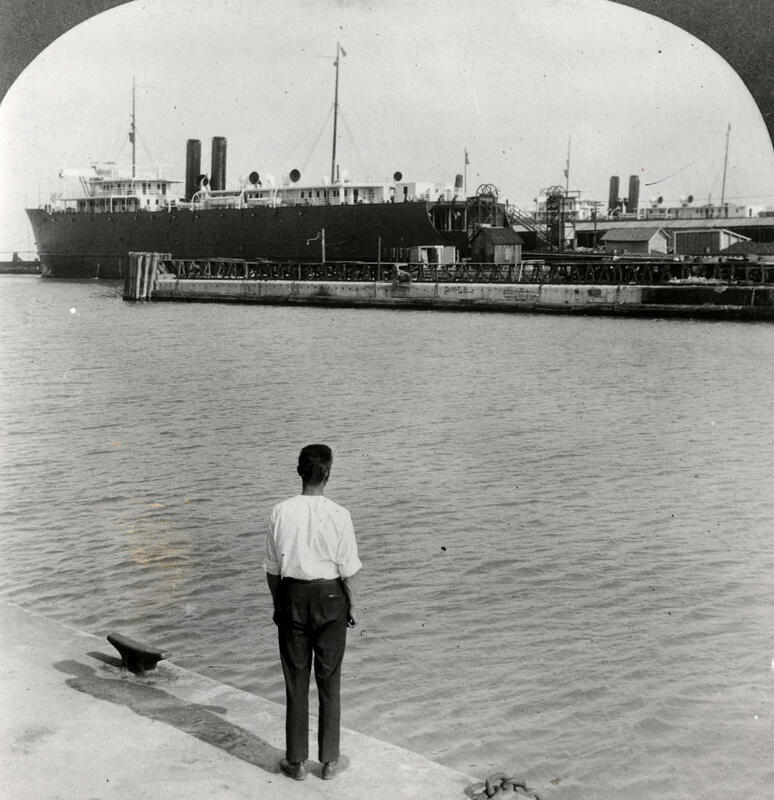 A ferry at the dock at Trumbo Point in Key West in the 1920s. Now, about 150,000 people a year use ferries to travel to and from Key West — people like Lisa Leonard from Jackson, Mich. She has a time-share in Fort Myers and took the Key West Express to spend one night on the island. "I would do it again," Leonard said. "It's a great way to get here." And if she could hop on a ferry for Cuba? "Absolutely. I think it would be great," she said. "It's a good way to experience something that you haven't before." Many in Key West are hoping that a lot of people will feel like Leonard does. City Commissioner Tony Yaniz recently visited Cuba for the first time since he left in 1960, as a 10-year-old boy. "It's time to rebuild what Key West and Cuba had. The cultural and historical ties that bind us are inseparable," Yaniz said. After his return from Cuba, he called for the entire Key West City commission to make a goodwill trip across the Straits of Florida. "I'm going back at the end of May. At this point, it looks like I am going alone," Yaniz said. "But I am going to represent the city officially this time. And I would also like to call to have a Havana delegation come to Key West." A return to the days of daily ferry traffic between the islands is a dream for many in the Keys — even those who don't have family or cultural ties to Cuba. The city-owned ferry terminal at Key West's historic seaport now sees daily arrivals and departures to and from Dry Tortugas National Park and Florida's Gulf Coast. "It almost feels like you could look out over the water at night and see the lights of Havana," said Robin Smith-Martin, a business consultant who grew up in Key West. "You can't actually do that, but being only 90 miles away, this is something we've thought about all of lives." Smith-Martin worked on Stock Island Marina Village on Safe Harbor. 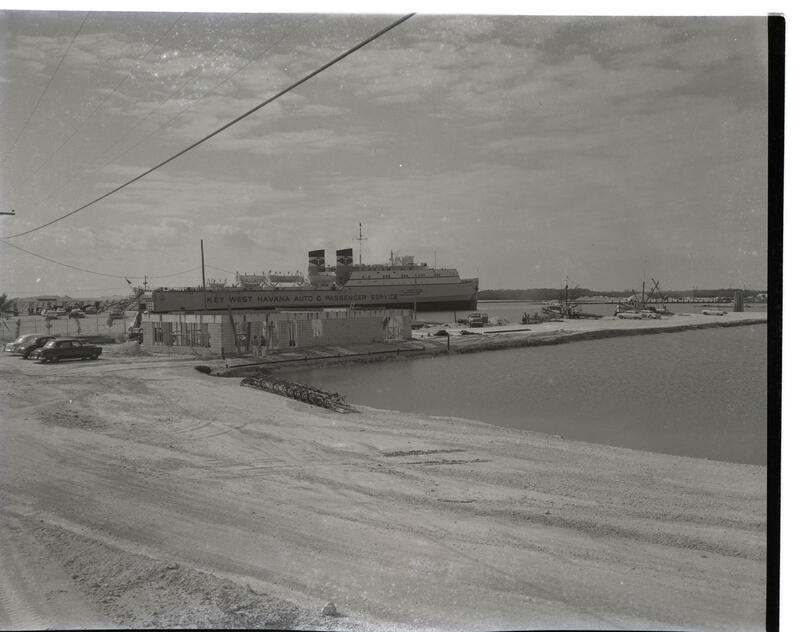 That deepwater port is where the auto ferries docked in the 1950s. And it's seen now as one of the best options for a new ferry base. The city's ferry terminal is another. And Smith-Martin said there's a third option that few people are discussing — the Navy-owned pier at Truman Annex on Key West Harbor. The Navy now leases the pier to the city for cruise ship docking, so it can handle big ships. But there could be other complications. "Allowing direct ferry service from Communist Cuba to unload at a U.S. military installation might be hard to swallow in the near term," Smith-Martin said. "But it's a function of how hard people want to push and who their friends are in the Obama administration." Smith-Martin also said there may be limited appeal to traveling to Cuba by ferry. "There's a lot of romance about taking a boat to Havana from the Keys or from Miami. And I think a lot of people are going to do it... once," Smith-Martin said. "The fact is, there's a lot of water between Key West and Havana. It can be very variable. Beautiful flat days and extremely rough days. So I think everybody's going to do it once, and then after that they're going to look at that 45-minute plane trip and choose that as their second option." Stock Island, the island next to Key West, was the port for auto ferries to Cuba in the 1950s. Many think it might serve that role again. The biggest hurdle facing the resumption of ferry service is the lack of customs facilities in Key West. To handle passengers entering the country, with luggage, you need a station just like you have at an international airport. And that station has to be built to customs specifications, said Doug Bradshaw, Key West's port director. "Their specs run the gamut from a bulletproof area out front in their waiting room to a holding cell for somebody you may have to keep there for awhile," Bradshaw said. "There's a lot involved in actual construction of a facility that will meet their standards and get approved." Despite Key West's lack of facilities now, Bradshaw said it makes sense for ferry operators to base their trips on the island, rather than from bigger ports like Miami or Tampa. "To run from here to Cuba, especially in the winter months, it's going to be difficult for a boat because the seas can get very rough," he said. "So I'm assuming the shorter they can make that trip, cost-wise, fuel-wise, everything, it works better in their business plan." Between the proximity and the allure of travel between the islands, Key Westers like Yaniz are confident someone will return the island to the days when you would visit Havana as frequently and casually as a trip to the mainland. "With today's technology and the boats that I'm hearing about, [it's] four hours, four and a half hours to Havana," Yaniz said. "Just enough time to have two mojitos, dance a little salsa and you're in Havana." The United States issued licenses for ferry service between the United States and Cuba for the first time in five decades. The South Florida Sun-Sentinel reports the Treasury Department issued at least four licenses to companies that want to establish ferry service to Cuba from Key West, Miami, Fort Lauderdale and perhaps even Tampa. In the '60s, '70s and '80s, waves of Cuban immigrants crossed the Florida Straits, seeking political freedom and economic opportunity. Soon they were starting their own businesses and winning political office, infusing Cuban culture into the DNA of a South Florida city. The city was Key West. And this was the 1860s, '70s and '80s. Is U.S.-Cuba Texting The Next Telecom Barrier To Fall? If you’ve ever tried to send a text message to someone in Cuba, you know that… you can’t do it. But as the U.S. and Cuba normalize relations, a number of telecom barriers between the two countries are coming down. And it looks like the latest is texting. Sandra Ramos has never wanted to emigrate from Cuba, but in her more than four decades on the island, she has seen many people leave. Their absence resonates throughout her work. The image of her as a 10-year-old is plastered behind a wall of palm trees, trapped on the island. In another piece, her school girl's body lies across a gaping space in the middle of a bridge, trying to connect two separate lands. "It's a perspective on immigration from those who stay," Ramos said. 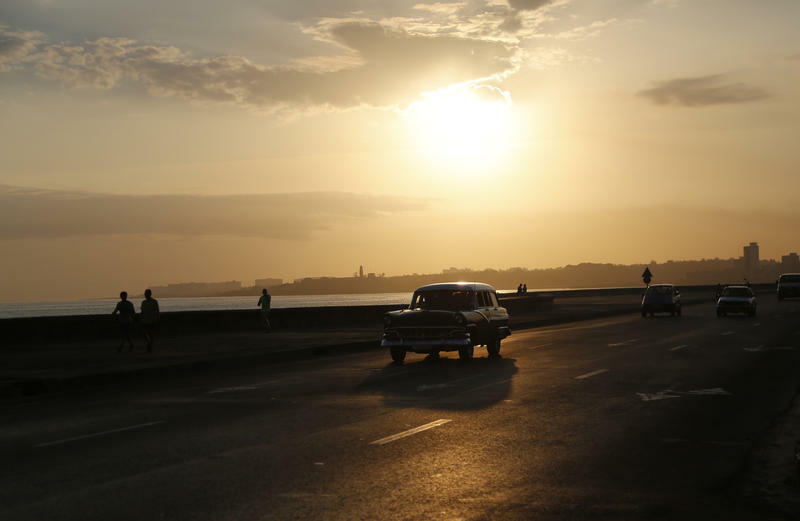 U.S. Cuba Policy Changes: Opportunity Or Entrenchment? Miami is not a top departure point for American goods headed to Cuba. So say the official U.S. government trade statistics. Port Everglades in Fort Lauderdale is the second-largest American port from which goods are sent to Cuba. Yes, despite the 53-year-old trade embargo, America still does a little business with Cuba. The U.S. sells fresh and frozen chicken, soybeans, corn and an assortment of other food and medical supplies.